When it’s this hot, I have negative interest in turning on my stove. Like, I’d sooner eat oranges and raw fish for the rest of my summer. Luckily, with this recipe, I can do exactly that. There are lots of ways to enjoy raw fish. The Japanese have sushi. Italians have carpaccio. And Peru…. oh, Peru. Peru gave us ceviche. 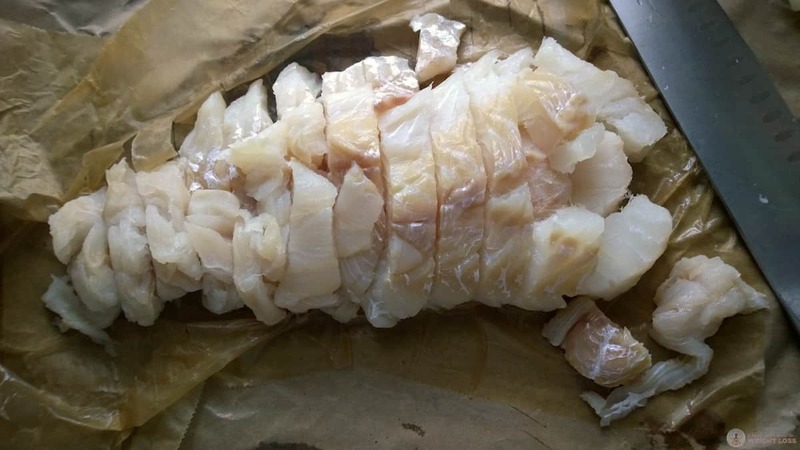 This process can take anywhere from 10 minutes to an hour, depending on the kind of fish you’re using and how thoroughly you like it, uh, “cooked.” Light fish can take around 15 minutes, meatier fish can go for much longer. Traditional ceviche is mad spicy—cultures nearest the equator often have spicier recipes and meals than those closer to the North and South poles because it helps their bodies cope with the often harsh hot weather. Spicy food makes you sweat, and sweat is your body’s internal effort to help you cool down. It also doesn’t require a specific type of fish. 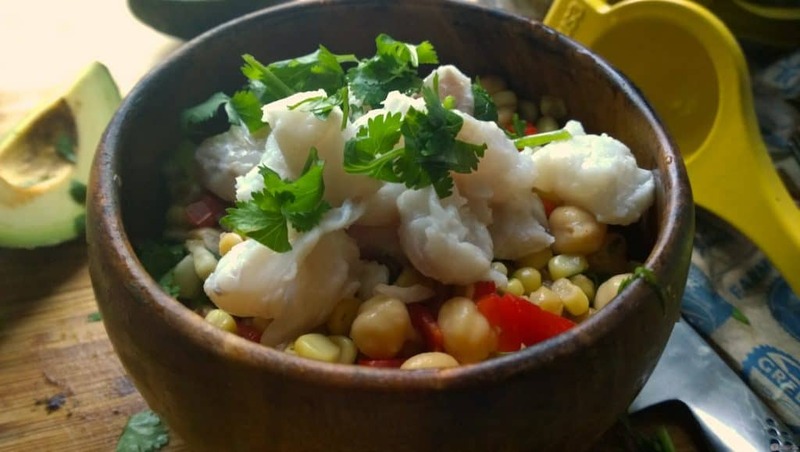 I’m using cod in this recipe, but you can use tilapia, catfish, or any other kind of seafood—shrimp, clam, and tuna ceviche are all very common. The kind of citrus fruit you can use in making ceviche isn’t particularly restrictive, either. It only needs to have citrus acid. It can be tomato—though, because tomato doesn’t contain a lot of it, it might take longer— or grapefruit or oranges or blood oranges or berries (not blueberries, though) or any of them. The world is literally your oyster. Which sounds delicious right now. One thing that is required, however, is either extremely fresh fish or fish that has been frozen for damn near a week. Denaturation may change the fish’s flesh, but it will not kill the kinds of bacteria that can be most harmful to your digestive system. Citrus isn’t capable of that. If anything, they’d merely slow down the growth and expansion of the bacteria, but it’d still be there. 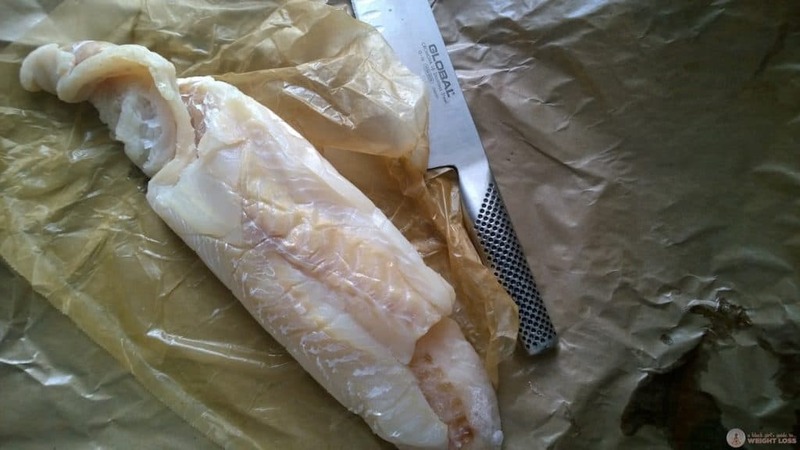 Fresh fish hasn’t had the time to grow that much bacteria, and fish that has been frozen for a week’s time will have killed off the bacteria that could cause harm. 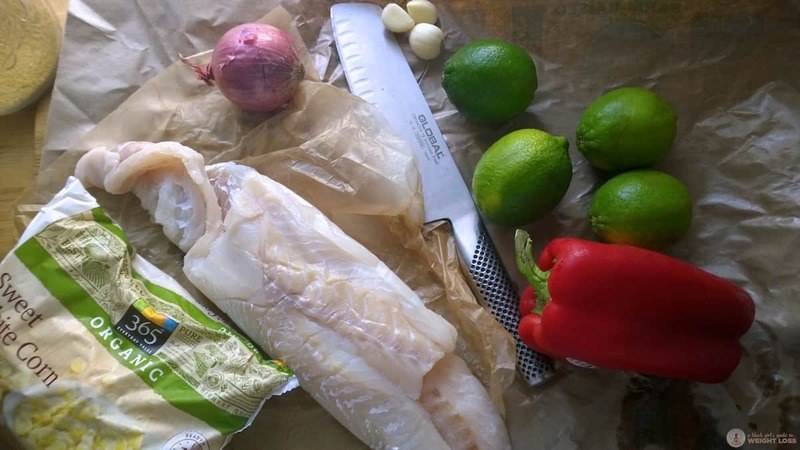 Here, I have a pound and a half of fresh cod, a bag of frozen organic corn that I let thaw, a red bell pepper, four limes, a small red onion, three cloves of garlic—I really like garlic—and, not pictured, a can of chickpeas, a dried chili pepper, half an avocado and a small handful of cilantro. 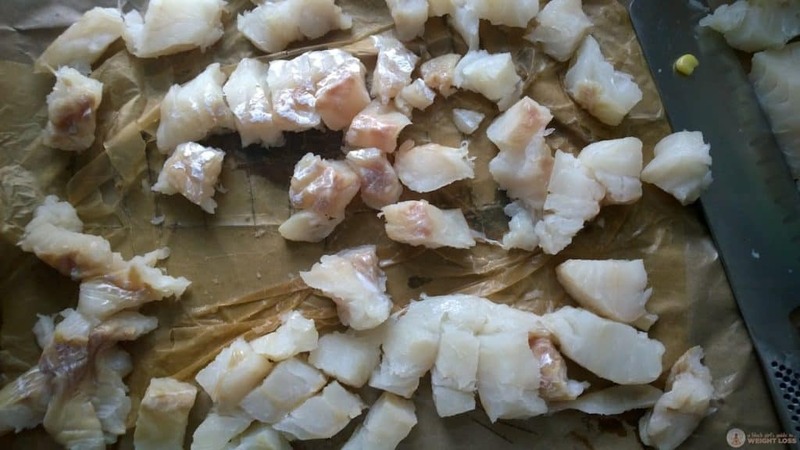 …then cut those strips into chunks. Place your fish in a mixing bowl. Take a pinch of kosher salt and sprinkle it over the top, then take all four of your limes and squeeze them over the top. 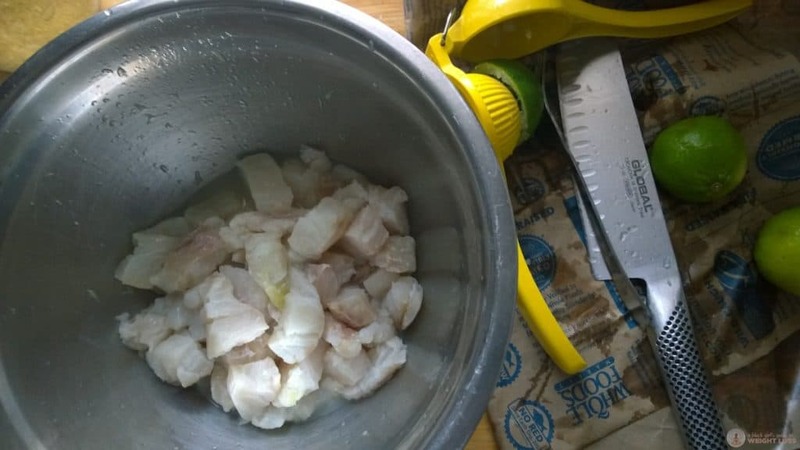 You don’t need your fish to be covered in lime juice, just need it to all get a nice good coating. Set that aside and let it chill by itself. 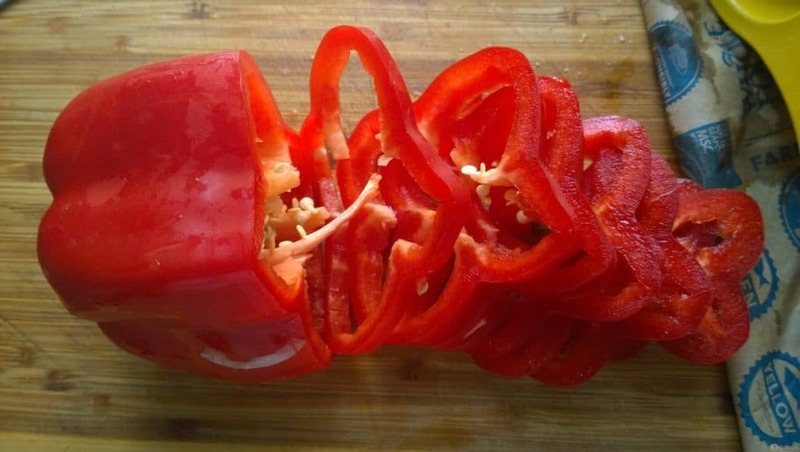 From here, take your red pepper and slice it the short way, as pictured above. 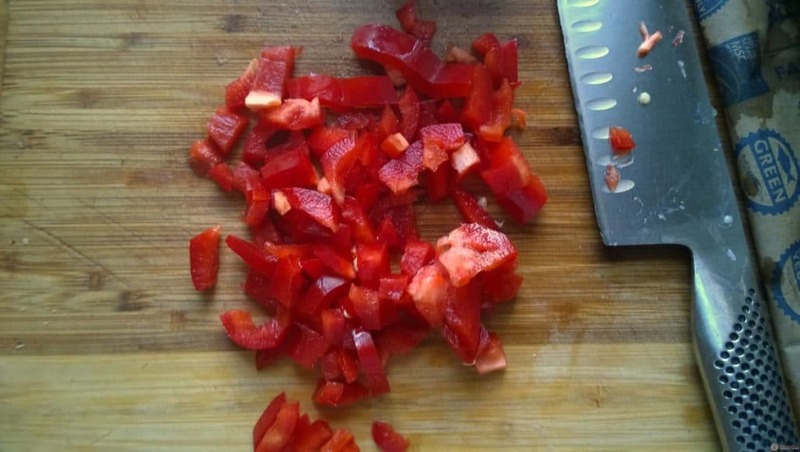 Then cut across those star-shaped strips, and voilá—you have diced a red pepper! While you’re doing this, keep an eye on your fish—is it starting to look a little less transparent and a little more white? Good. Stir it up again, to make sure your juice is getting on as many pieces as possible. If not, that’s okay. Stir it up. Now, dice your red onion. Don’t know how to do that without it taking forever? I’ve gotcha. 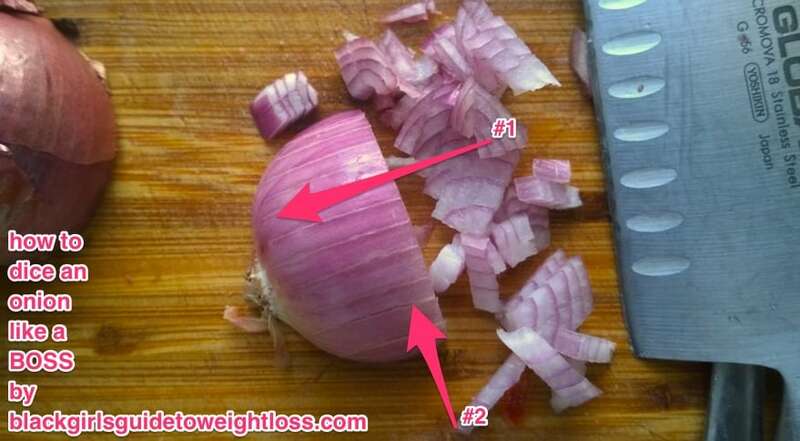 If you look very closely, you’ll see there are thin cuts in this onion that go from the stem/root of the onion outward to the other side in the direction that arrow #1 is pointing and, just like that arrow stops before reaching the stem, so should your knife. You want to cut slits in the onion, but you don’t want all your slices to separate in the same way we did the red pepper. 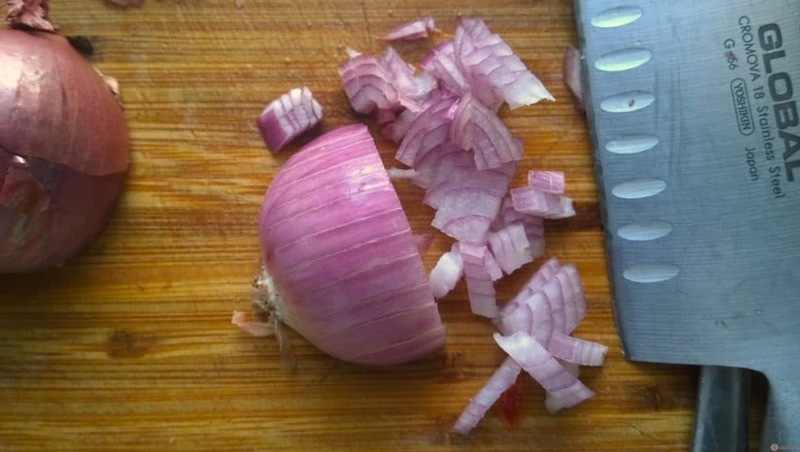 That way, when you cut the onion in the same direction as arrow #2, you get a nice little dice in your onion the same way as shown in the picture. 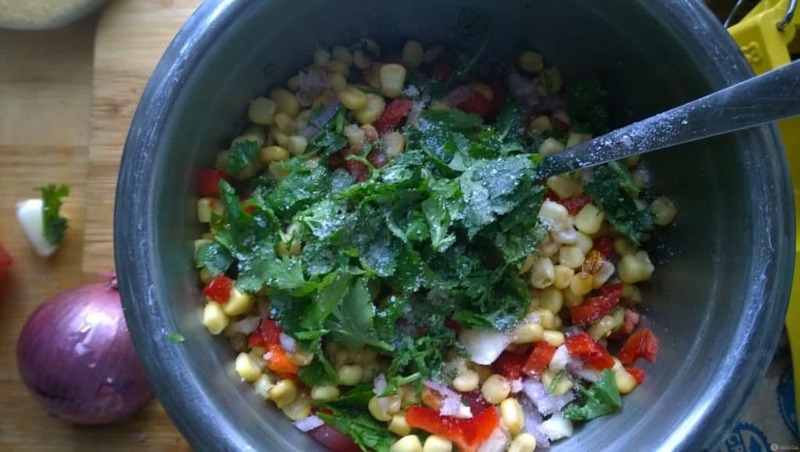 Dump your corn, onion, and red pepper in a mixing bowl. 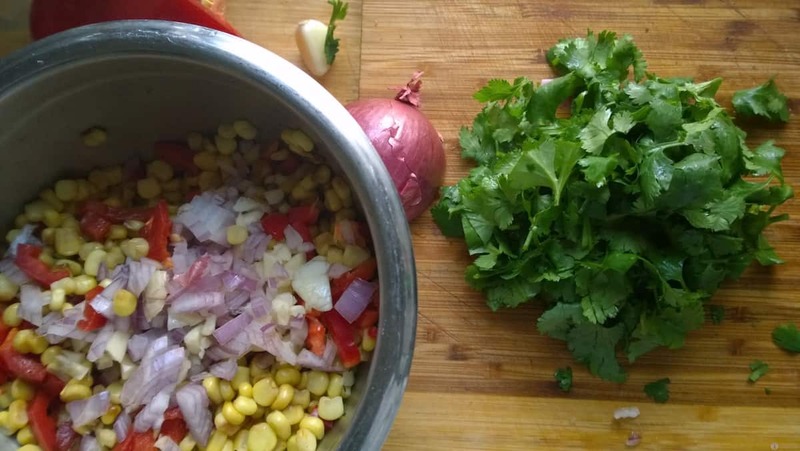 Dice your garlic, cilantro, and your chili pepper, and toss those in the bowl with everything. Looks delicious, right? Sprinkle a fat pinch of kosher salt across the entire bowl. 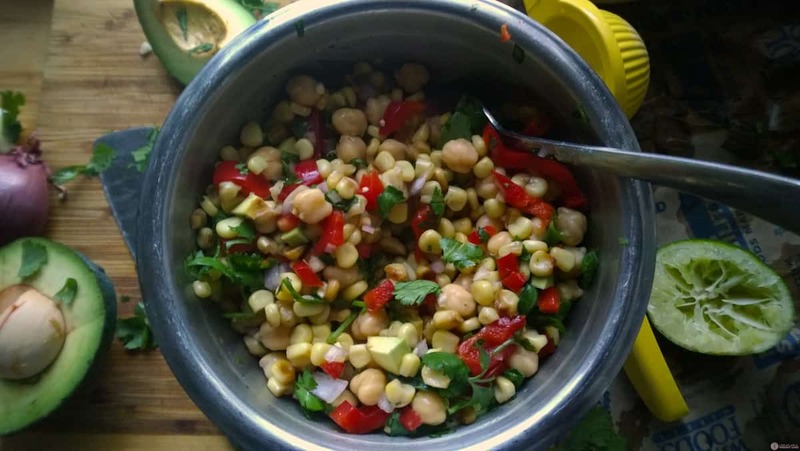 Add in your drained chickpeas and avocado, and stir it all in together. By now, about 15 or so minutes should’ve passed. 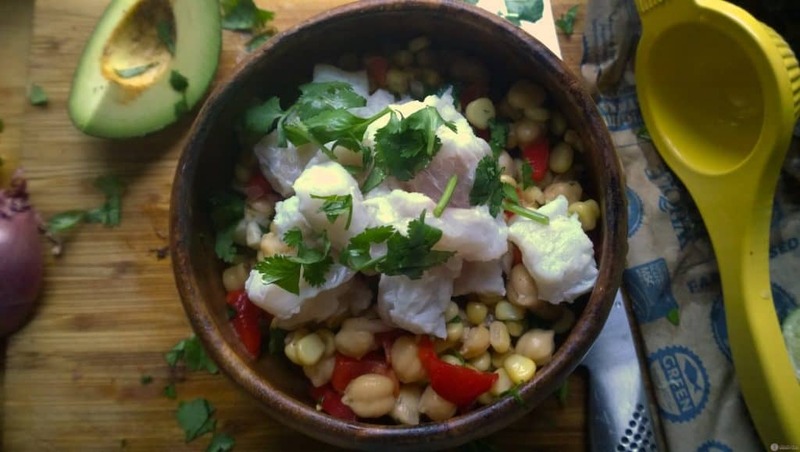 Once your fish is looking a bit more solid, put your corn and chickpea salad in a bowl or on a plate, and place your fish on top! It. Looks. Delicious. Shoot, it is delicious. Just wondering approximately how many servings would I get out of this recipe? There’s at least two with leftovers, here.